There is a difficult line between being safety conscious, and being over protective. People are allowed to take risks. People with disabilities are clearly people, and therefore are allowed to take risks. Oddly enough this is not the start of a justification for the inherent risks in Pony Access and its work, exactly the reverse in fact. Because Pony Access is new, it can’t get away with the traditional defence, by which I mean the defence that it is traditional. Horse riding is traditionally dangerous, carriage driving, probably more so, but Pony Access isn’t traditional. Pony Access is safe for beginners. When I built my first pony drawn vehicle, the Saddlechariot, an insanely good fun, two wheeled, one man, pony drawn vehicle, I came up with the idea of the Entry Level Equestrian Activity, aka ELEA, hardly a zingy title and not much of a zingy acronym, and to compound the problems, the Saddlechariot was safe, but not safe enough. At the time it was probably the safest participant equestrian activity, but that isn’t saying very much. The problem with getting on a horse, or even a pony, is that you are now on a horse or pony, and to be honest, since professionals can’t reliably control the animals, a beginner stands no chance. Anyone who claims they can reliably control a horse or pony, can explain why there is a special word, “bolting” to describe the activities of said animal when it sets off, at high speed, out of control. A combination of no reliable control, and the action of gravity, means that if you get on to said animal and things go pear shaped you are going to fall off, maybe at low speed, maybe at high speed, but whatever speed the animal may be doing, you are going to accelerate towards the ground at 32ft per second per second, normally, head first. Hospitals are full of the results. Getting on a traditional horse drawn vehicle has different risks. The animal can still bolt, but it is now attached to the vehicle you are in. Sometimes they stop safely, sometimes the vehicle rolls over, crushing you, sometimes the animal resorts to kicking the vehicle to bits. If you are in a wheelchair, tied down onto a vehicle that is attached to an out of control, and very powerful animal, you have problems. Don’t think about applying brakes. Horses drag ploughs through the ground, dragging a wheel over the top of the ground isn’t a problem. Hoeing rowcrops at Shillingford Organic. My Saddlechariot wasn’t safe enough, but it was the safest thing for miles around. I had been toying with the idea of a wheelchair enabled three wheeler for some time, but a number of factors didn’t work. Then a modification to the harness design made the three wheeler a lot easier and a year later when mucking around with a complicated version for commercial hoeing of row crops, I discovered the secret of building horse drawn three wheelers that worked. To celebrate I drove my very early prototype from Exeter to London, 200 miles + and drove round London’s Hyde Park, on my own, in a wheelchair, pony powered. A 200 mile + drive, without any support, relying on finding a place to camp each night, over 16 nights, teaches you a lot, and the vehicle was a lot better when I got back home to rebuild it. Meeting a really superb metal worker, John Howson, a traditional blacksmith who can make iron and steel dance to his tune, transformed the vehicle and the iBex was born. Three years working with a group of friends with disabilities, and with some local schools and care homes, transformed the iBex into the ridiculously safe vehicle it is now. At the heart of the safety system is the Saddlechariot Instant Pony Release System. My Entry Level Equestrian Activity couldn’t work with the Saddlechariot, because you have to get off the vehicle before releasing the pony. The iBex with the Instant Pony Release System, has no problem. You release the pony and the vehicle just sits there, brakes automatically engaged. 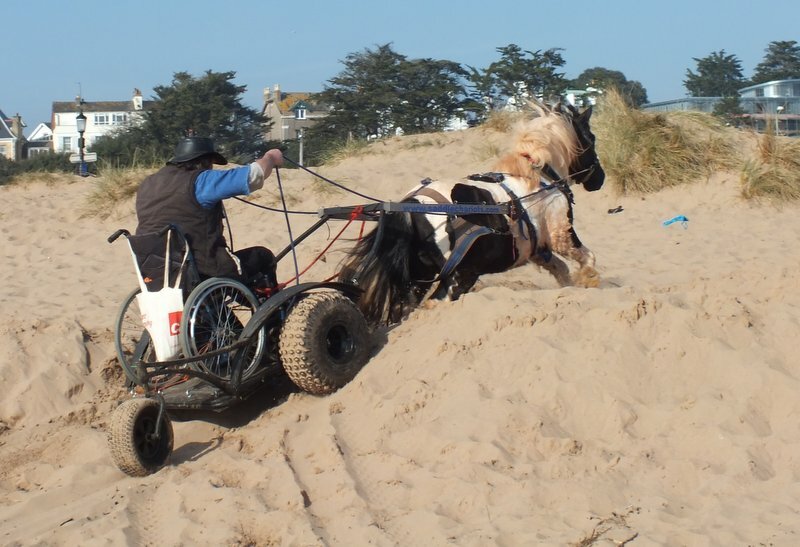 The instant release can be operated by the driver, by a carer walking alongside, by anyone leading the pony and by remote control from a distance. The Instant Pony Release System gets rid of the single, biggest risk of equestrian activities. Horses basic instinct, when scared is to run, very fast. It is what they are good at. And they are good at it because it is their standard defence from danger. Horses don’t run to anything, but away from everything, which can be used as part of a safety system. When they are running, they are running away from any, and all, threats. They only stop running when there is nothing threatening around, or they are completely exhausted. What a horse sees as safety is a large patch of grass, preferably short, with no objects that predators can hide behind, and no people. If you let the animal run, he will go to a place that feels safe to him, but which coincidentally is safe for all the people, and their property. Therefore, if you can let the animal go, it will head as fast as possible for a place where it, and everyone else is safe. So let it go. Therefore the Instant Pony Release System not only makes the vehicle safe, because it is no longer attached to a powerful, high speed, unpredictable propulsion unit, but the powerful, unpredictable, propulsion unit will head at full speed to a place where it and everyone else is safe. Win, win all round. All the other safety features pale into insignificance by comparison with the Instant Pony Release System. It makes the training manual really simple. “If you are worried, pull the release cord!” That simplicity is a safety factor. You don’t have to remember anything else, pull the release rope and all is safe. The iBex pony drawn vehicle is now a static piece of garden furniture. I have watched it for hours, without a pony attached, it just sits there. And the pony, when released, is going to head for safety, safety for it, safety for everyone else. At the beginning of this article, I only said the system was safe for beginners. And this is important. If you want to have a go on a pony drawn wheelchair enabled vehicle, then you should expect to roll away at the end of the session un harmed. With Pony Access, you can. Any other equestrian activity carries the risk of injury or death, even for complete beginners on their first session. But Pony Access can offer life threatening challenges. If you choose to drive at high speed, cross country, on dangerous terrain, accidents are perfectly possible. The Instant Pony Release System can save you at any stage when you decide enough is enough, and let the pony go. But if you decide to see if the vehicle will fit between those rocks, and it won’t, you are in a high speed impact with rocks. The Instant Pony Release System is the equivalent of a sailing boat with the option, at any stage, to step off onto dry land. But this only works while the boat is still upright. If you push it to capsize the system won’t save you. The same is true with the Instant Pony Release System. If you pull it when danger threatens, it can keep you safe. But if you wait till you have smacked it into a solid object at high speed, I am afraid it is too late. You have the choice. Pony Access uses its insane level of safety to give you the choice to break your neck. But it is your choice. I won’t let a beginner break their neck, or get damaged in any way, because they are not yet in a position to make an informed choice about risk. Once you have learned what the iBex can do, and where a pony can take you, then you can choose to push the boundaries and increase the risk level, but it will be your choice and your request. Pony Access as an Entry Level Equestrian Activity, is safe. It will remain safe. If you decide you have gone beyond entry level, then the world opens up with a whole range of challenges, with their attendant risks. But you will start safely, and you will continue safely, until you choose to go up a level. Safety is central to Pony Access, but so is choice. You have the choice to be safe, and continue with the safe activities that Pony Access offers, or, when you have gained experience and the necessary skills to minimise the risks of going high speed across difficult terrain, you can choose to take the risks. It is an open ended choice, but without the safety levels of the Instant Pony Release system, you wouldn’t have the choice of the Safe option. Safety is vital. Without safety, people can be excluded, “for their own good”. With a safe system, Pony Access is open to all.